Hospice volunteers offer practical and emotional support and companionship for the journey, whether it is at home, in the hospital or in a residential care facility such as McKinney Place, Sunnybank or Mariposa Gardens. Volunteers may read to the client, listen to their concerns, share mutual interests, run small errands, or simply provide a silent presence. Volunteers provide both practical and emotional support for Palliative Care Clients and their families and friends. Hospice volunteers telephone clients / caregivers on Thursday afternoons to assure they have the necessary supplies, medications, equipment and support for each coming weekend. 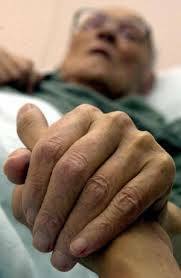 Any needs are then communicated by the volunteer to the Palliative Care Nurse. Volunteers offer emotional and practical support and information to family members. Volunteers provide family and primary caregivers with a brief respite or pause, usually 2-4 hours, from their care giving responsibilities. This gives caregivers an opportunity to undertake activities which might otherwise have to be forgone. Even short breaks for activities such as a walk, trip to the store, haircut, or social activity can provide the necessary downtime to reenergize a caregiver. Remember, care givers require support too! Hospice Volunteers may be requested on short notice to provide one on one support for a client during his or her final hours, or support to a family members during this often difficult time. Volunteers may be called on to provide grief and bereavement support to the family members of clients. We offer one-to-one grief support - this program consists of meeting with a specially trained Hospice Volunteer for support as you grieve. Click here for more information. In the early days of grief, individuals may need someone to talk with about their loss. Hospice volunteers are available to support bereaved individuals by offering compassionate, non-judgmental listening on the telephone. A series of telephone calls are made at specific intervals over a one-year period.